We decided to take a short break to Edinburgh as my oldest son is very interested in cities at the moment and, after having visited London last summer, he told us he wanted to see all the other capital cities of the UK. Not sure we’ll be visiting Cardiff or Belfast any time soon as they’re a bit far for us up here in the North East, but Edinburgh is a doddle. Just over two hours drive and, I’m happy to report, absolutely no problems during the journey from any of the three children! We have a Renault Espace car, so we have lots of space. Charlie (7) and Henry (4) sat in the very back seats which allowed for our very compact Zia Petite Star pushchair to sit behind them. (Front wheel removes v.easily so they had lots of space). Then Mathilde (2) occupied the middle seat with our bags and Me and Chris were upfront. Our first stop off was at a Toby restaurant in Shiremoor, just north of the Tyne Tunnel. It’s a bit of a Grey family tradition to have a big breakfast as we start a holiday and these types of eateries are usually really good for the kids as they often eat free. Charlie managed SIX sausages! Henry always opts for a few bowls of cereal and Mathilde loved the hash browns. If you’re a family with young children, you can’t go wrong! The border between England and Scotland is marked by a sign which made for a great photo opportunity! Mathilde was having a nap, but the boys found it amazing to “jump” from England into Scotland. We arrived in Edinburgh by mid afternoon on a Monday and we had to find our hotel, a Premier Inn. We usually book Premier Inns for our stays in the UK as they are nice and clean, reasonably priced and have great breakfasts. Being a family of five makes hotel stays difficult, but we’ve found Premier Inn to be very accommodating as long as we bring our Spider-man blow up bed with us! Really, the littlest should be in the air bed, but middle child won’t give it up, so Henry and Charlie slept next to each other on the floor of the hotel, with daddy having the single and Me and Mathilde in the double. We walked from our hotel, which was in the Haymarket business area of Edinburgh, along the Royal Mile and up to the Castle. We had the full afternoon to visit Edinburgh Castle and this was a big treat for Henry who loved knights and castles and kings. When Henry is doing something very important (such as helping daddy with a spot of DIY) or he is exploring something important (like a castle), he develops a very confident and authoritative “swagger”, so he spent the first half hour swaggering about proudly as he found secret stairways, spectacular views and lots of very important-looking cannons! It cost around £42 for the five of us to visit Edinburgh Castle and we only paid for Charlie as under 5’s are free. All in all, I think this was very reasonable as we spent a few hours there and there was lots to see. After the Castle we walked to Prince’s Street and found Hard Rock Café. Chris and I have visited lots of cities with a Hard Rock Café, but for no real reason we’d never eaten in one. Me, thinking it would be a cool family thing to do, decided we would go to this one and then see how many others we could all visit. I chose a burger which was very nice and very big, Chris chose a pulled pork sandwich – again nice but enormous! I’m not a huge fan of burgers, but it seemed to be the thing to have at Hard Rock Café and, to be honest, it was nice but not as amazing as I expected (or as the price tag suggested). The kids meals were the usual options of pizza, burger, nuggets etc. and both boys enjoyed their meals which were served on a guitar shaped plate. Mathilde, being 2, was having a not eating day so unfortunately she ate her grapes and half her chips, but not the chicken. For pudding, the children all had ice cream and Chris and I shared a dessert as we were still very full. With a couple of rounds of drinks, the bill came to a rather eye-watering £80.00. I’m not sure we’ll be going back as I don’t think the food quality was particularly special. The next day we had a huge breakfast in Premier Inn’s restaurant and then made the journey by car to Edinburgh Zoo. We paid for Henry this time, but Mathilde got in free and the total price for a family ticket was £57.00, which was expensive, but worth it as we spent the whole day there. When we arrived, Henry adopted his “swagger” again and with map in hand, he marched us up pathways telling us which way we needed to go. We double backed on ourselves a few times, but he was enjoying himself so it didn’t matter! There were some great exhibits at the zoo. I particularly enjoyed seeing the giant pandas and the children’s favourites were the monkeys (Charlie), lions (Henry) and penguins (Mathilde). We had been to the zoo before with Charlie when he was a baby and it is a bit of a hike as it seems to be built on a hillside, which really tired the kids out. There was a lot of fighting between the kids over who got to sit in Mathilde’s pushchair and there were a few squabbles between the adults over who had to push it up the hill! The gift shop wasn’t as good as I remembered from last time we visited. There were lots of stuffed animals and regular toy-shop books and toys but nothing particularly different there. Mathilde chose a lovely soft ball over the huge aray of stuffed animals, and Charlie decided to save his pocket money for an Avengers toy (the philistine! ), but picked up a zoo notepad and pencil. Henry opted to return to the Royal Mile to buy the knight’s sword and shield he saw from yesterday (we did!). After our zoo trip we returned to the hotel for a rest then went to a restaurant Chris had googled on his phone called “Burger”. Now, as I’d had a burger yesterday and as I’m not really a burger person, I had a chilli dog and it was lovely. The best thing about the food at this lovely restaurant, which seemed to serve a business clientele in the Haymarket area, were the chips. They were absolutely gorgeous and they hadn’t been peeled so had skin on which added to the taste. All three kids (and husband) thoroughly enjoyed the food here and, at half the price of Hard Rock Cafe, it was actually much nicer. Charlie also got to have a milkshake which he loves, but doesn’t get to have very often. The next day we had our third huge breakfast (this is the point when breakfasts start to wear a bit thin! ), checked out of our hotel and headed into the town. We parked our car in a shopping centre car park, walked the Royal Mile again and visited a few shops. Charlie (the toy philistine!) bought his Avengers thinga-ma-jig in Jennings Department Store. We then made a lovely trip to the Edinburgh Museum of Childhood, which was made even more fabulous because it was free! I love toys (obviously!) and I had a great time browsing the cases filled with dolls, dolls houses, toys, clothes from years ago. It was a lot of fun for the children too. Not only did they see toys which mammy and daddy used to play with, but they saw lots of things grandma, grandad and gran played with when they were little too! Henry spots Paddington and Mathilde spots dollies! My middle child, Henry, is a 1950s throwback! He loves traditional boy thing like trains, cowboys, pirates and knights. My troublesome middle one loves nothing more than to dress up and take on a whole load of characters, with drawers full of “doots” (suits) and against my better judgement also an array of pretend weaponry. When Henry wakes up the first thing you hear is the sound of his dress-up drawer opening, a belt going on and tied expertly around his pyjamas then a sword and sheath slotted through the belt and finally a gun slung on his back. Here is Henry on his 4th birthday last October. So, what would Henry, an energetic 4 year old, choose from Tilda and Tom’s collection of toys? – Seven wooden people including Indian chief, bandit, sheriff and saloon barmaid! As you can see from the picture, even the box serves a purpose as a backdrop to the scene as well as somewhere to tidy up all the play pieces when finished. One of the best things about Janod’s toys is that they’re beautifully presented and, as a result, make perfect gifts. Tilda and Tom stock three Story Box playsets: Far West, Circus and Farm and cost £25.00 plus P&P. We also have lots of add-ons from cars, trucks and figures to large train sets. As you all probably know, I’m a sucker for a good, quality toy. One which won’t break or snap or have bits that will tear or pieces that will come off and get lost. When I look at a toy to buy for Tilda and Tom I source only the best from the most respected European brands. I already knew Moulin Roty well before I started my business after buying a few toys for my daughter in France and in specialist stores in the UK. Of all my European brands, Moulin Roty possibly has the stronger presence in UK stores and online. The Grande Famille range of dressed animals is proving particularly popular with customers and I am so happy to share these gorgeous little toys with so many people. The mix of fabrics used by Moulin Roty in all of their products are so unique and will be appreciated by all who love well made, beautifully designed, precious little things. Different variations of Jeanne the Goose (we stock the “Tiny” version!). My other four current companies were all new to me when I first had the idea to embark on this venture back in January. (Sometimes I find it hard to believe that I’ve done all of this in just three months, lol!). My best selling toys to date are Janod’s wonderful wooden toys. These fabulous toys are the epitome of “Made to Last”. It’s hard to explain until you hold one of their toys in your hands for the first time, but everything about a Janod toy screams “quality”. Wooden toys have a long history in Europe and play things for children have been crafted from wood for centuries. Wooden dolls houses, wooden rocking horses, wooden dolls, wooden animals … go to any Museum of Childhood and you will still see perfectly preserved wooden toys that have lasted hundreds of years. There are many European, British and Worldwide manufacturers of wooden toys, but with Janod I believe I found something different. Janod toys are a perfect mix of traditional craftsmanship and modern design. I love retro toys and toys made to look old, but Janod’s acceptance of the modern is unique and special to them. I think this is what has made this particular brand so popular. Oh, and then there’s the packaging! I love a nice box and Janod makes almost as much of a feature of their packaging as they do the actual toy. You just can’t beat the quality of these toys! Selection of Janod’s wooden play people and vehicles from the Storybox range. The next brand I sourced has likewise been very popular with customers. Oskar & Ellen are a Swedish company which provided a solution to the age old problem (for me) of “too much plastic everywhere”. I have three children aged 7, 4 and 2 and a school holiday or a weekend’s play results in an obstacle course of getting from one side of the room to another without standing on plastic tea cups and play food, plastic Lego or Playmobil men together with their creations, missing vital pieces of pirate ships and dolls houses all covering a floor which you can barely see! Lol! Oskar & Ellen have solved a problem for me. Lovely soft tea sets, play sets and play food! Nothing to break, big pieces that won’t get lost and if it gets dirty, pop it in the washing machine! This is before we mention how beautiful these toys are. Handmade from lovely fabric, children can play with everything from amazingly detailed fairies, pirates, dragons and spacemen to sandwiches, strawberries, teacups and even Californian sushi rolls! My fourth company is extremely rare in the UK and I’m yet to find another toy retailer to stock the quirky puzzles and toys manufactured in Spain by Londji. Imported directly from Catalonia and made in Barcelona, Londji are a highly creative company which mixes art and design with puzzles and puppets. I am particularly fond of their 3 metre long winding “My River” and “My Race” jigsaw puzzles which will make a perfect gift for adults as well as children. Londji is also an ethical company, producing all of their toys from recycled, and very strong, cardboard. The designs of these toys have such a special look about them that they’re instantly recognisable as a Londji product. The amazing 300 cm long “My River” jigsaw puzzle by Londji. I’m hoping to add more lines of these gorgeous toys to Tilda and Tom’s repertoire very quickly as there’s so many more lovely things to choose from. Toys “Made to Last” is what Tilda and Tom are all about. We’ve just returned from a mini-break to Edinburgh with the family and enjoyed an hour or so in the Museum of Childhood on the Royal Mile. As my children gazed into the glass cases looking at toys played with by not only Mammy and Daddy, but also by Grandma and Grandad, I knew with absolute certainty that, 100 years from now, toys offered by Tilda and Tom will still be around and will still be in great condition! Well it ABSOLUTELY is when you’re 7, according to my oldest child, Charlie. When I was young one of my favourite things to do was to hunt through atlases looking at all the names of all the different countries. 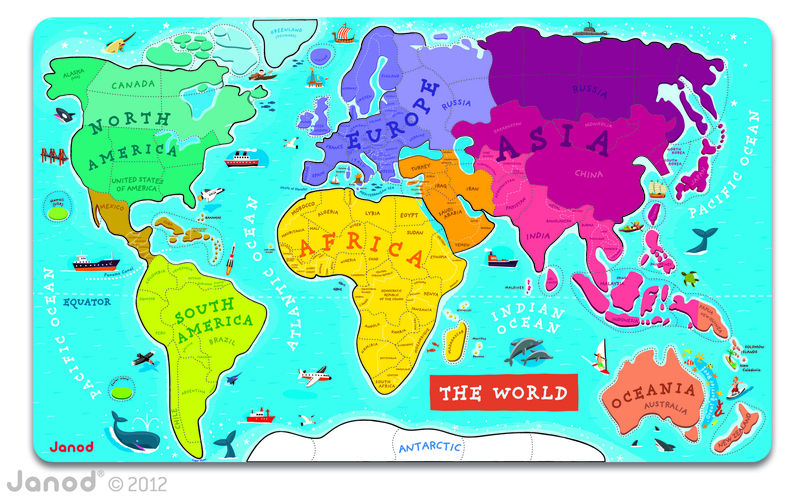 I had a fabulous jigsaw puzzle which was beautifully decorated with images representing the countries of the world and a wooden UK jigsaw puzzle where you had to fit all the counties together. 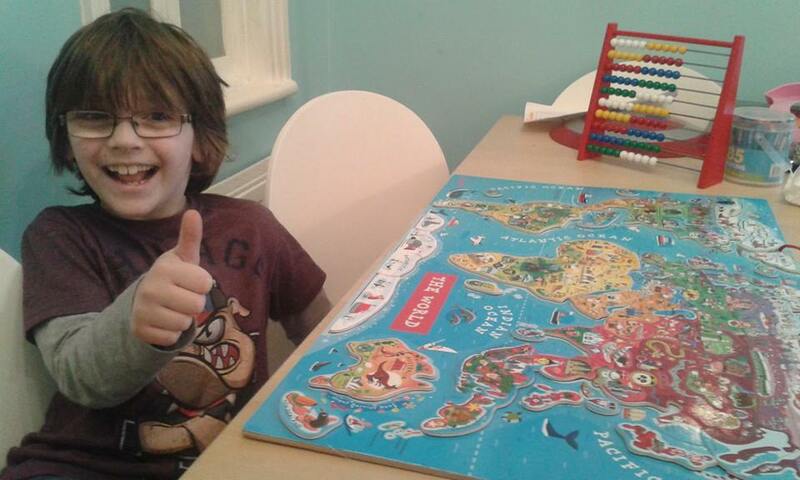 I was so pleased when my eldest child started taking an interest in the countries of the world too. He’d been learning a little bit at school about the UK and he came home to tell me all about the four countries of the UK and their capital cities. 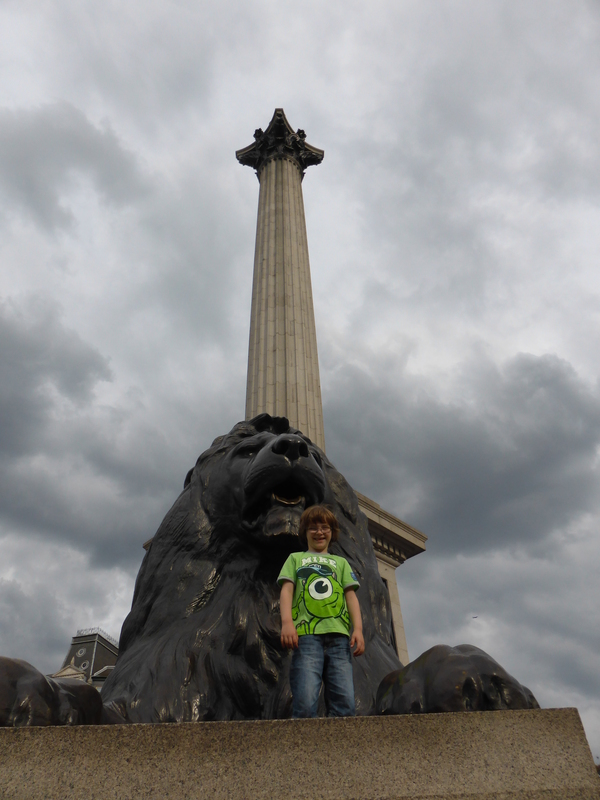 He was so excited and interested to learn more that we took him to London for a little visit in the last summer holidays. Since then, we’ve bought him books on cities, a children’s atlas, trump cards about London and New York City (the place he wants to go to most! ), info cards on the biggest buildings in the world (it’s the Burj Khalifa btw.) and much more! We’ve already played with this map many times in the last week and it’s been popular with customers too as we’ve actually just sold out (more stock coming soon, so don’t fret!!). 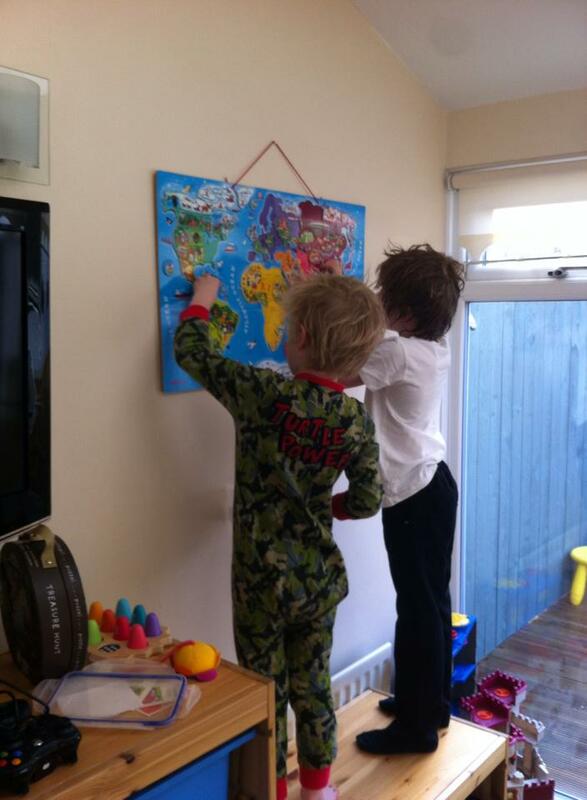 And here is a photo a customer sent me of her sons, Toby and Reuben, playing with their map which looks great hung on a wall in their playroom! 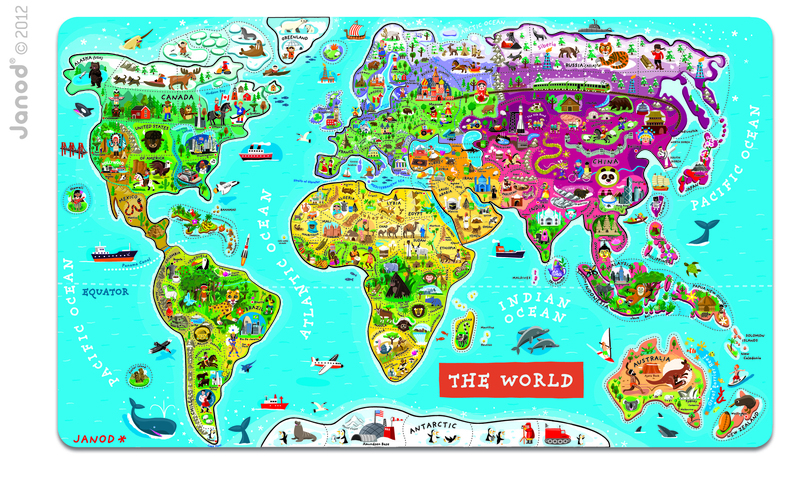 The Janod Magnetic World Map costs £45.00 plus £3.95 P&P. In the summer of 2012, I was newly pregnant with my third child and holidaying in the south of France with my husband and two boys (then aged 4 and 18 months). It was nearing the end of our holiday when we stumbled upon a little shop in Nice’s Old Town, selling beautiful French baby gifts. In amongst the painted wooden shape-sorters, music boxes, stackers and puppets was a little stand selling Moulin Roty soft toys and it was love at first sight! I could have bought out that whole shop for my new baby, but I chose a little grey mouse – lovingly named “Nini” – in a cute little red dress to take home as a special memento of our holiday. That was the first time I saw Moulin Roty’s beautiful products and I’ve added to my daughter’s collection with more dolls and animals since, including Jeanne the goose, Felicie the chicken and Sylvain the rabbit. Fast forward two years and I decide to share my love of high quality, beautifully designed and expertly crafted European toys through an online toy shop. Tilda and Tom’s vision is to bring together the finest children’s toy brands from around Europe, providing a truly inspirational shopping experience. We at Tilda and Tom are passionate about quality, design and uniqueness. Our concept is to hand-pick only the finest brands from across Europe and offer them to you at the best possible price. As the brand which spearheaded our vision, Moulin Roty takes pride of place as first chosen – a perfect match for Tilda and Tom’s commitment to provide parents, grandparents, friends and relatives of young children with a first-class shopping experience. We guarantee that everyone who shops at Tilda and Tom will choose a gift destined to be loved for years to come by a very special little person. Join us on our journey to grow our company and add more and more excellent brands to our portfolio. CHRISTMAS GIFT GUIDE Part 2 – Little Pirate Fans!